When we talk about detox, we usually talk about a body detox. It is a way to get rid of toxins in our body. But there is another type of detox you should try, and that is hair detox. Same as in our body, debris, dirt, and dead skin cells can accumulate in the scalp, and prevent regular hair growth. This simple treatment aims to solve all of that. Designed specifically to remove dirt, pollutants, and any other type of buildup lingering in your scalp. Not only helps remove buildup, but the scalp treatment will also help with bacteria, infections, and even dandruff. The result is healthy encourage of hair growth. You can practice this hair treatment once per week to remove any toxins, dirt, and pollutants from your hair. After that, your hair will be back to its glorious state. 1 What you will need? 2 What baking soda does for your hair? 3 What cinnamon does for your hair? 4 What olive oil does for your hair? 5 How the DIY scalp detox treatment helps hair growth? 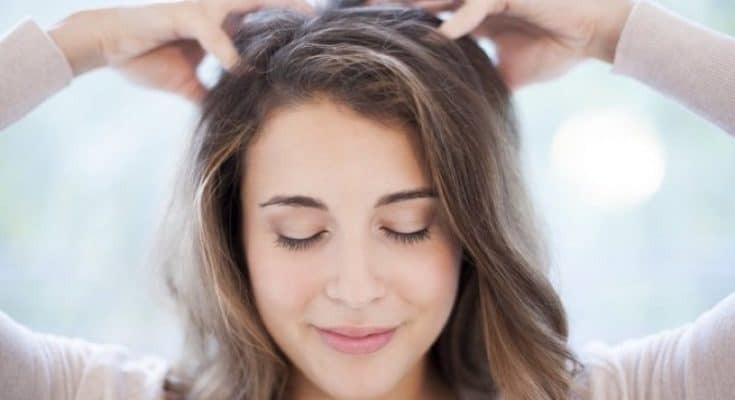 This simple DIY scalp treatment requires only three ingredients. And we are sure you already have all of them at home. ½ teaspoon of cinnamon powder. What baking soda does for your hair? Baking soda is a popular ingredient in DIY treatments. In terms of hair treatment, there is a lot of controversy regarding using only baking soda on your scalp. The baking soda rinse is under some scrutiny, but the ingredient is generally considered safe for your scalp. Baking soda is an exfoliating agent but also helps balance the pH value of your hair. Being alkaline, baking soda helps bring the pH value of your hair to its normal levels. And at the same time, baking soda makes sure there is no more debris and dirt on your hair. What cinnamon does for your hair? While baking soda is a rather controversial ingredient for hair wash, cinnamon is clearly a beneficial one. Cinnamon is mostly known for its ability to stimulate hair growth and reduce any signs of aging. Used on your face, cinnamon can tone fine lines and wrinkles. When using on our scalp, cinnamon can exfoliate the scalp on both physical and chemical level. Not many other ingredients can do that. Used on the scalp, cinnamon helps remove buildup from the scalp, allowing your hair follicles to promote healthy hair growth. Cinnamon also causes a tingling sensation when used on the scalp, which draws more blood to the scalp and improves circulation. What olive oil does for your hair? Olive oil is one of the best things you can apply on your scalp. There is a reason why olive oil is part of many hair masks and treatments. For starters, olive oil is rich in monounsaturated fatty acids, vitamin E, and palmitic acid, all of which help nourish your scalp. Olive oil brings some of the essential nutrients for hair growth to your scalp. All of the acids in olive oil are emollients, which means they soften and smoothen your scalp and hair. They help lubricate the surface of the scalp, reducing any itching and irritation. Olive oil also works as a natural conditioner and moisturizer for your scalp. In the same time, vitamin E helps fight off free-radical damage done by sunlight exposure and pollution exposure. How the DIY scalp detox treatment helps hair growth? We mentioned the benefits of each of the individual ingredients of the DIY detox scalp treatment. Combined together, they form a potent solution for hair growth.